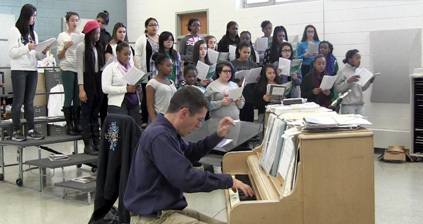 Mixed Chorus teacher, Todd Cole, playing the piano while the class sings along. Photo from Blue and Gold archives. MICCA is an annual competition that takes place throughout Massachusetts. The competition is for marching band groups as well as choral groups. The competition happens all throughout the state and are for many different levels of singers and grade levels. Throughout the competition, nine different categories were used to judge each ensemble: tone quality, balance and blend, intonation, expression style, and phrasing, dynamics, rhythm precision and temp as one section and then articulation bowing or direction, technical facility and finally repertoire. Then each section is graded to be either superior, excellent, good, fair and needs improvement. Throughout the competition, Malden High School hit the stage twice, once with their Concert Quire and once with Madrigals. “This year [they sang] three songs for both concert choir and Madrigals. In concert choir [they] sang, O vos Omnes, a level six piece, Loch Lomand, and Grace Before Sleep. In madrigals [they] [sang], Hark, all ye lovely saints, Agnus Dei, and Chili con Carne,” said senior Jessica Ong, a participant of the choir. The group was also very thankful to Cole and “proud of all of the work he does for [the class], especially in preparation for MICCA,” said Batista. The group will not be performing again for this competition again until the spring of next year. However, they are looking forward to their next opportunity to participate.